From left to right: Terri Bedminster, director of operations for the Refuge Centre; Catherine Tompkins, associate dean of Health Sciences and director, School of Nursing; Steven Rolfe, assistant clinical professor with the School of Nursing and director of policy and planning at Homestead. 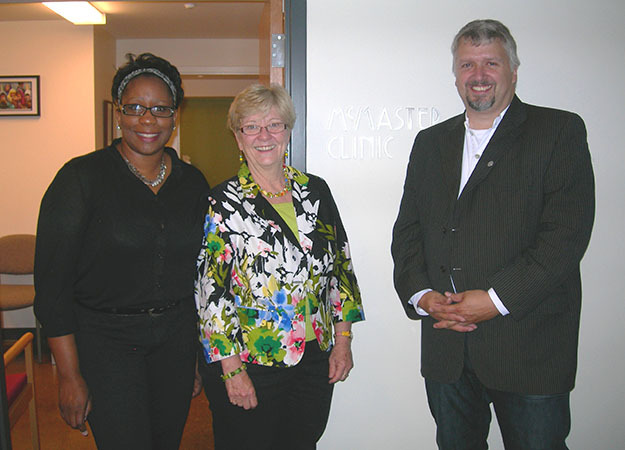 As part of ongoing outreach efforts in Hamilton, the McMaster School of Nursing has joined forces with two local organizations to launch a clinical teaching facility at the Perkins Centre. The new clinic, which will provide healthcare for newcomers to Canada, was made possible thanks to partnerships with Refuge Centre for Hamilton Newcomer Health and Homestead Christian Care. The Refuge Centre’s original location is on Hughson Street South in downtown Hamilton. The opening of their second clinic at 1429 Main St. E. comes at a time when recent federal budget cuts have made it more difficult for some newcomers to access health care. Several fourth-year nursing students will do their clinical placements at the new clinic, working alongside a nurse practitioner and volunteer nurses to provide health services to refugees and new immigrants. “The School of Nursing is known to be quite innovative in its approach to learning, so it makes perfect sense that students learn in the community and work with the people they will eventually serve,” says Terri Bedminster, director of operations for the Refuge Centre. More than 300 students have already taken classes at the School of Nursing’s community site (housed within the Perkins Centre) since it opened in 2011. Various classes at Perkins have helped introduce McMaster students to the surrounding community, where they can see first-hand the role of nursing in community development and health promotion. Students at the new facility will be sharpening their primary care nursing skills by performing health histories and assessments, vaccinations, and learning more about care in culturally diverse situations, disease prevention, health promotion, building community links and social determinants of health. “It’s great exposure for the students. There’s the multicultural aspect and getting to see the role of the NP. Hopefully in the future we can have teams of students — undergraduate and NP students — working together out of the clinic,” adds Tompkins. A large number of newcomers to Canada reside in the area around the Perkins Centre, and the facility is innovative in providing local access to this population of patients, says Steven Rolfe, assistant clinical professor (Nursing) and director of policy and planning at Homestead. “The placement of the clinic in the east end is ideal. We thought this would be a great place to learn and to provide service. The clinic is open on Tuesdays and Thursdays from 9 a.m. to 4:30 p.m. Nurses or physicians who would like to volunteer are asked to contact Terri Bedminster at terri@newcomerhealth.ca. As part of ongoing outreach efforts in Hamilton, the McMaster School of Nursing has joined forces with two local organizations to launch a clinical teaching facility at the Perkins Centre. The new clinic, which will provide healthcare for newcomers to Canada, was made possible thanks to partnerships with Refuge Centre for Hamilton Newcomer Health and Homestead Christian Care. The Refuge Centre's original location is on Hughson Street South in downtown Hamilton. The opening of their second clinic at 1429 Main St. E. comes at a time when recent federal budget cuts have made it more difficult for some newcomers to access health care. "It was always our dream to have an opportunity to provide service in this area through a health clinic," says Catherine Tompkins, associate dean of Health Sciences and director, School of Nursing. "It’s important because it’s an under-serviced area and a high-needs population, especially with the recent cuts." Several fourth-year nursing students will do their clinical placements at the new clinic, working alongside a nurse practitioner and volunteer nurses to provide health services to refugees and new immigrants. "The School of Nursing is known to be quite innovative in its approach to learning, so it makes perfect sense that students learn in the community and work with the people they will eventually serve," says Terri Bedminster, director of operations for the Refuge Centre. More than 300 students have already taken classes at the School of Nursing's community site (housed within the Perkins Centre) since it opened in 2011. Various classes at Perkins have helped introduce McMaster students to the surrounding community, where they can see first-hand the role of nursing in community development and health promotion. Students at the new facility will be sharpening their primary care nursing skills by performing health histories and assessments, vaccinations, and learning more about care in culturally diverse situations, disease prevention, health promotion, building community links and social determinants of health. “It’s great exposure for the students. There’s the multicultural aspect and getting to see the role of the NP. Hopefully in the future we can have teams of students — undergraduate and NP students — working together out of the clinic,” adds Tompkins. A large number of newcomers to Canada reside in the area around the Perkins Centre, and the facility is innovative in providing local access to this population of patients, says Steven Rolfe, assistant clinical professor (Nursing) and director of policy and planning at Homestead. "The placement of the clinic in the east end is ideal. We thought this would be a great place to learn and to provide service. “The opportunity in partnering with Refuge was to create real educational experiences for nursing students in an emerging field. These experiences are grounded in social justice,” explains Rolfe. “They’re gaining a good understanding about how health policy has a direct impact on people’s lives.” Olive Wahoush, McMaster’s assistant dean of undergraduate nursing education, says: "It’s a wonderful opportunity to address such a significant need in our community, and students will learn about the challenges newcomers face." The clinic is open on Tuesdays and Thursdays from 9 a.m. to 4:30 p.m. Nurses or physicians who would like to volunteer are asked to contact Terri Bedminster at <a href="mailto:terri@newcomerhealth.ca">terri@newcomerhealth.ca</a>.